Yarg! Don’t you hate it when you spend so long thinking about what you want to write about you totally flub up your own deadline and then have to push it to tomorrow? I hate that. But, I love making pirate noises, so, upside! Since I procrastinated too long on trying to respond back to @jwmoss’s inquiry, I’m gonna make this a mighty mini post, because it’s about time I did a round up. AHOY! St. Patrick’s Day is tomorrow. Wear green and don’t get pinched. Don’t wear green and you can get pinched then give a law suit! Just wear green and have fun. Also, if you’re imbibing, do so safely. I have no plans, because I need to wake up at 5:45 in the morning during the week, so someone can sip a Guiness for me. I’m gonna try and add “upside” to things when I notice I’m being too much of a downer. Example, “Today, at the dentist, I found out I have a cavity… Upside! It’ll be tooth covered and I have brand spanking new dental insurance benefits, soooo, sweet! 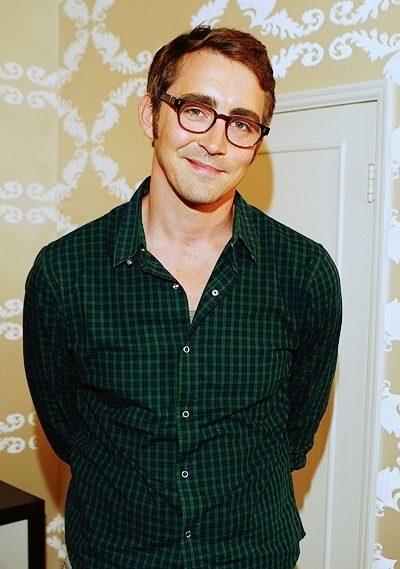 I may have mentioned this before, but it begs repeating, Lee Pace is too friggin’ cute. Seriously. Following the Pie Holers on tumblr is making me swoon daily. Awkward hands in pocket shuffling and nervous smiles makes me laugh. I may have to go buy both seasons on DVD and smile beaucoup. Also adorable? Curtis Stone. I’d forgotten how cute he was since for some stupid reason Take Home Chef is no longer on television. But he is on the Biggest Loser and he’s so sweet and charming. Also, fun? The ladies on the show totally agree and always swoon when he’s around. I like when people on TV say what I’m thinking, bonus points if they get my exact facial expression down. Side note? How friggin’ obvious is it that the Blue Team is stacked to win. IT MAKES ME SO MAD! I can’t decide if it’s because Michael was so unabashed about it or the fact that Sam is a super stand-up guy who deserves to win and yet may loose it because he’s on a weaker team. Bummer. A big thanks to Kohl’s for messing up a return, but then having an awesome customer service employee be so sweet and totally make up for it. Plus, when I wanted to buy the shirt, I got an e-mail alert for a Kohl’s online sale so I got 15% off my purchase. Everything ended up working out great. Ok, lemme tell you something. 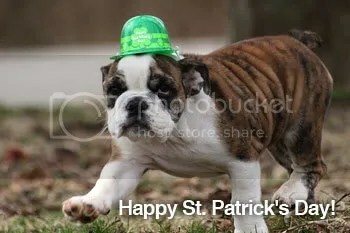 While searching for fun St. Patty’s day pics I found some really adorable ones and I just want to post them. I’m actually so distracted by how cute some of these are that I can’t really think of anything else to add to the mighty mini list, which means y’all get a pic spam. You're Irish, Cute and too small for your hat. A triple threat indeed. This dog has sunglasses. Your argument is invalid. AH! I want to hug this dog! Arrggggg, ye be seein’ enough for the evenin’. Off to the stars with ye! That’s not an Irish accent, it’s a callback to my aforementioned love for pirate talk… Nevermind, I’ll exit quietly.